A simple service to email you a weather forecast each day - with an email that is formatted for mobile and doesn't contain 50% ads. You think there are other services that do this? You're wrong. I tried them all and they are terrible, go look at my comparisons. 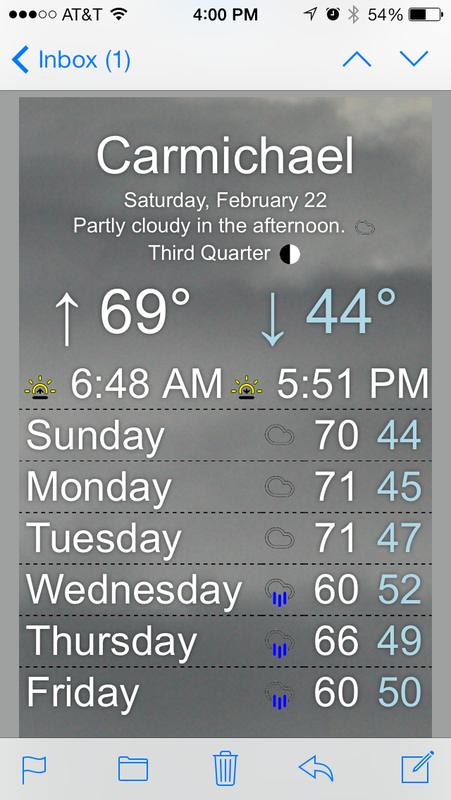 Get a beautiful mobile-optimized email of the upcoming weather conditions. The email subject is optimized to make the banner and notification center views beautiful. Get an email every day - or only if there are certain weather conditions coming in the next week such as rain, snow, tornado, etc. It's a one-page app using HTML/JS using REST APIs to a J2EE backend hosted on Google App Engine. The project is available on Github so why not contribute?